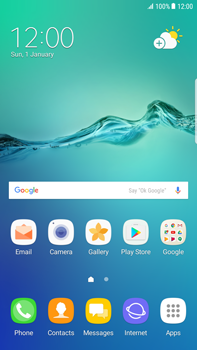 The Samsung G928F Galaxy S6 edge+ – Android Nougat should already have the correct settings to use mobile internet. You can access the internet on your Samsung G928F Galaxy S6 edge+ – Android Nougat via your mobile internet service, but also via a Wi-Fi connection. If an aircraft symbol is shown in the status bar, this mode should be disabled. To do this, choose Apps > Settings > Connections and disable Flight mode. For instructions on how to configure internet on your Samsung G928F Galaxy S6 edge+ – Android Nougat, see the information below.